In cities such as Athens women had few rights and little opportunity to take part in sports, theatre, or public life. Because of this we know only the most general details of their lives, interests, and pursuits. But life would be different for Aspasia. Born in Miletus, an Ionian Greek settlement on the coast of Western Turkey, she would not be bound by the same rules that restricted Athenian citizen women, and would eventually attain the sort of fame and prominence usually associated only with men. 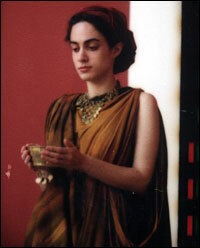 Aspasia's father, Axiochus, had insisted his daughter be raised and schooled by her mother and household slaves; an education which seems to have been unusually thorough, especially for a girl. It was probably during her childhood that she discovered the great power women often possessed in myths and heard stories of the those few other real women who had left a lasting impression on her age; women like Artemesia, Queen of Halicarnassus. Exposed to a melting pot of ideas, cultures, and influences, Aspasia's decision to leave her home city and journey east to Athens would have been quite remarkable for a man, for a young, unmarried woman it was almost unheard of.